The Creswick Campus Historical Collection comes under the School of Ecosystem and Forest Sciences, which is in the Faculty of Science. The Creswick Campus Historical Collection is located at the University of Melbourne’s Campus in Creswick, Victoria. It is a unique and noteworthy collection which documents more than 100 years of forestry education in Creswick from the beginning of the Victorian School of Forestry in 1910. The Collection recounts the personal and professional histories of those who have studied, worked and lived at the School of Forestry. Notable items include numerous examples of staff and student work, photographs, and several natural history collections. A substantial school herbarium contains specimens collected by former staff and students as well as esteemed scientists including Baron von Mueller. The collection is managed by the School of Ecosystem and Forest Sciences. 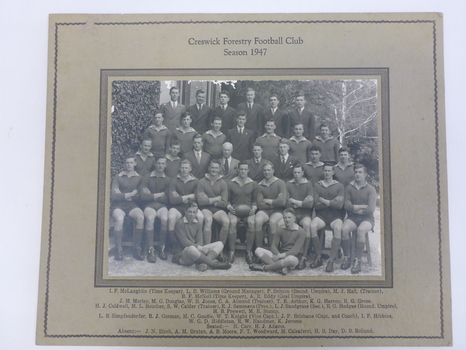 The Creswick Campus Cultural Collection is historically significant as it recounts the personal and professional histories of those who have studied, worked and lived at the forestry school. This collection enables the documentation of related themes including student life at the Creswick Campus, early forest management and conservation methods, and the professional interests and achievements of former staff members. Furthermore, the Collection possesses historical significance for its ability to show how the broader social events of the past century have contributed to these narratives; including the impact of the First and Second World Wars and the increased public awareness of environmental issues. The Collection retains on-going social significance to past and present staff and students of the forestry school as well as members of the larger Creswick community. More than a century of forestry in Creswick has seen the histories of the town and school entwine, and the contemporary social significance of the Collection is evidenced by continued bequests and new donations. Results register. Certificate of Applied Science (Conservation and Resource Development) Units. This a draft copy of the paper written by Rob Youl. Seed, leaf, bud and distribution. Prepared by Ron Hately at the end of his first student year. This is a folio of photographs of the Creswick Plantations presented to the 1928 Empire Forestry Conference. related to item 1434. 2 additional folios -State Nursery Macedon. Ballarat Botanic Gardens. Photographs of mature specimens of timber trees from the State plantation Creswick, the State Nursery Macedon and the Ballarat Botanic Gardens. Photographs loosely bound into 3 sets. 2 x dark brown loose covers, 1 x dark green loose cover, bound with coloured embroidery thread. Subject: King Lake . 6 brown envelopes marked Run 3, 4, 7, 7a, 8, 9 containing c. 80 prints. 1 section of a topographical map marked State Aerial Survey. Stored in a brown cardboard file box marked King Lake Run No.3 - 9. (x9). Photos commissioned by Forests Commission Victoria. Students in the VSF Museum. Freddie Craig and Leo Teller.There is a framed copy and an unframed copy. This is a Catalogue of VSF Museum specimens. Timber Specimens (cont), Coniferous cones, fruit & seed; Fruits of Eucalyptus; Fruits of other genera; Seeds; Soil samples; A.P.M. samples. These are a collection of approximately 7,000 glass plate negatives of microscopic cross sections of wood and related images taken by H. E. Dadswell from the Wood Collection he curated at the CSIRO.